“We’ll make a general, aggressive deck and defensive deck and balance it, which is still in there. You pull all the cards out, you can see the underlying base cards in those 3 different flavors.” — Rob Daviau, creator of Star Wars Epic Duels, in February 2018. Click on the charts if you need to enlarge them. “Top 5 Offense” and “Top 5 Defense” are provided for a quick comparison of decks in a typical game, assuming you play your 5 best attack cards as attacks and 5 best defense cards as defense. Even though it rarely works out that way exactly and it depends a lot upon your mix of talent cards, we think it’s a better way to compare decks than the Total Offense and Defense values that many other folks use to compare decks. Minors tend to be a little more offensive in role so we’re only counting 4 of their cards as defense. The Blue Deck is part of the original Hasbro game, as used by Obi-Wan, Mace and Dooku. It is considered a balanced deck or what Rob Daviau calls a “general” deck, but it is actually very strong, with solid offense, great defense, and great flexibility. A Blue Deck with no additional defense is solid enough defense for any character and the pair of A5s forces defense to be played against any attack. It is similar in power level to the Green deck, depending upon the exact mix of talent cards, and is a stronger overall deck than the Red and Yellow decks in most cases. The Green deck is part of the original Hasbro game and is used by Yoda and Emperor Palpatine. In Geektopia, it is similarly only used by Jedi and Sith Masters, but I don’t see the deck as being restricted to them. It is stronger than the Red and Yellow decks, but only similar in power level to the Blue Deck. Rob Daviau discussed a “general, aggressive and defense deck” and this one is the defensive deck. The defense is nice, especially since special cards tend to be heavy on offense, but a lack of A5s is definitely a trade-off. The Red deck is part of the original Hasbro game, as used by Anakin, Luke, Maul and Vader. It is considered an “aggressive” deck but is more accurately a weak basic deck when compared with the Blue or Green decks, mostly because it gets stuck with an A3D2 that the other two decks don’t. If you add up total values, it looks like Red has 6 more offense than Blue and 6 less defense. The reality is closer to Red doing 2 more points of damage (4x A5D1 vs 2x A5D1 and 2x A4D2 for Blue), while blocking 4 fewer points of damage, and Red is the only standard deck among majors and personality minors that has fewer than 2x D4s. It can be as effective as Blue if it has a complement of power defense cards among its talent cards, though this is rare. 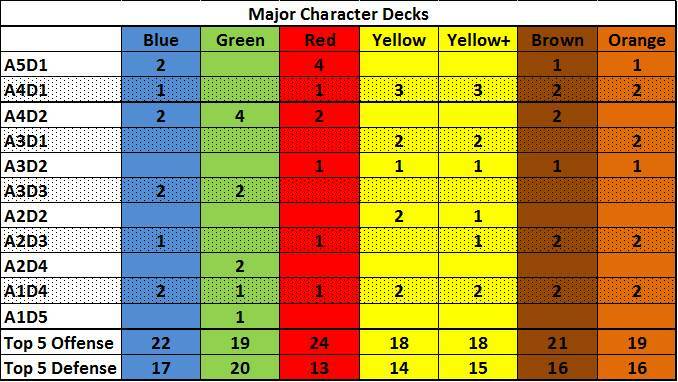 We find that characters with Red decks need additional staying power to be competitive with Blue and Green decks. The Yellow deck is part of the original Hasbro game and is used by Boba and Jango, while Han uses the Yellow+ deck, which gives him an added 1 point of defense. It is the ranged deck of the group and it is significantly weaker than the other 3 decks in overall damage output and damage-stopping power (actually it has 1 point of defense more than the Red but much worse offense). In the original game, these decks are used by characters with few hit points, making these characters especially fragile. In Geektopia, Bounty Hunter types who use Yellow decks typically get a ton of offense to help compensate for their lack of staying power, but are still weaker than Blue, Green and Red deck characters for the most part. Still, we’ve managed to turn Boba Fett into a solid Tier 2 character with the same basic Yellow deck he’s always had, and in the Geektopia universe, no known shooters would be stronger than Boba Fett. Finn, introduced more recently, uses a Yellow* deck where an A5 replaces an A4, as a new variant of the Yellow. The Orange deck is a custom deck that this group was involved in pioneering and is based off the original Strong+ Ranged Minor deck. Though we’ve seen the Orange deck used elsewhere for pure shooters who are considered to be tough or as a “refined” Yellow deck, in Geektopia it is a ranged deck intended for use by force-sensitive characters who use both blasters and lightsabers. Examples include Bespin Luke and Aurra Sing. It is stronger in offense and defense than the Yellow, meant to be a “Ranged Blue” deck in its power level. The Brown deck is a custom deck that Roman from this group was involved in pioneering. It is a melee deck intended for characters who are not Jedi/Sith or equivalent, sort of a “Melee Yellow” but a tad stronger than that. It is especially handy for Rey from Episode VII, who fights with a staff. Prior to Episode VII, our Jabba deck utilized this deck, and Cin Drallig’s Padawan minors used a Minor Brown deck. It could also be used for a Mandalorian Warrior type or anyone who uses a vibro-sword, etc. I’m listing this because I originally pioneered this deck, so I think it’s worth noting that we don’t actually use it. We play the game enough to card count, and part of that is limiting the amount of basic decks you have to think about. Ultimately, we found the Aqua deck to be not worth including in our set. I used to think of the Green Deck as more powerful than the Blue and Red, and therefore believed that an Aqua deck was needed as a defensive deck equal to the Blue and Red. Over time, I’ve come to see that Green is basically equivalent to Blue, and it’s the Red deck that lags behind both. So we don’t really need a weaker Green deck; if you want a defensive deck, the Green will work just fine. This group pioneered the Strong Melee Minor deck, also known as the Minor Blue deck, in our Luminara & Barriss deck long ago. It is intended for use by minor Jedi/Sith such as Barriss Offee or Padawan Obi-Wan Kenobi (who has a Strong+). It also works for Jedi Guardians or Grievous’ Magna Guards. 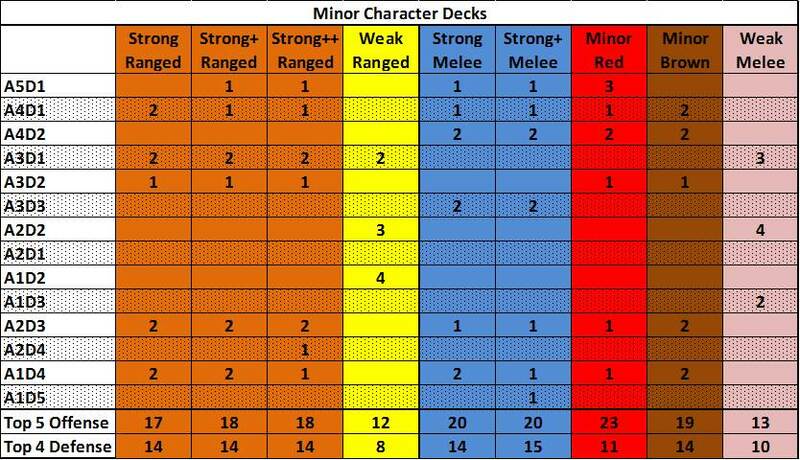 The Minor Red deck tends to work a little better than the major version, as minors serve more of a damage-doing role. We use it for Jedi Knight Anakin in our Obi & Ani deck and for Darth Sidious Sith Apprentice in our Darth Plagueis deck. The Weak Melee Deck was pioneered by Roman as part of his LOTRED set, and is listed in case it is ever needed for Geektopia or any of its followers. Essentially for Minor versions of Major character decks, e.g. Minor Blue or Minor Red, you just remove the top card of the deck, an A5D1 for either the Blue or Red deck. One could create a Minor Green deck using the same principle of just removing an A4D2, which has been seen elsewhere for example in a Dagobah Luke with Yoda deck, but so far not in Geektopia. Notice the Strong Ranged Minor deck actually works out as the Minor Orange deck, while there really is no Minor Yellow deck and no need for one — if Greedo is using the Strong Ranged Minor, that has to be the floor for personality ranged minors. Where did you get the custom cards and little characters? And do you sell them? – There are .PDFs of all our decks and many more. Print on a color printer with 110 lb. cardstock and you should get good results. If you have access to a cutting board, that will make cutting the cards a lot quicker and easier. – The game Star Wars Minis created figures for just about every character in the SW universe, and many different sculpts for each major character. The game is out-of-print but you can literally get any figure you want on eBay or there are many stores online that sell Star Wars Minis figures, such as strikezoneonline.com, just Google it. If you want to let us know what you’re looking for, we have some spare figures we could sell you. Bloomilk.com is a good resource for SW Minis figures. Awesome! Thank you very much! I will definitely be checking those sites out for the figurines. I’m not sure what all I’ll be getting but I might ask you about what you have as well.